...And the most interesting part I can’t understand. 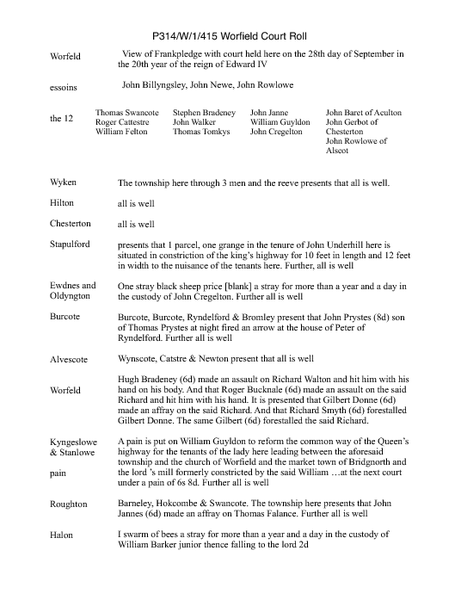 Roger Dalley plaintiff of John Jannes in a plea of trespass because the same defendant accused the plaintiff and 3 other men and 1 woman of shielding William Clerk of Wenlock and to working at the township of Kyngeslowe up to the marsh for the same reason 2s. And the said defendants sought a licence thence to discuss up to the next court.